Around the County Courthouse in Newton they have a saying... George Graham makes a lot of friends, but doesn't keep any for long. Graham rose in Sussex County politics from a local Democrat official to the Republican boss of county government. His political consulting business -- York Strategies -- was once closely associated with the campaigns of a number of Democrat candidates in Hudson County. Remember Assembly Speaker Joe Doria? The Hudson County Democrat was Governor Jim Florio's legislative point man in the passage of the most restrictive firearms ban in our nation's history. George Graham and his political consulting business, York Strategies, worked for Joe Doria in Hudson County. Graham was a registered Democrat when he worked for Doria. George Graham was a lifelong Democrat until switching to Republican to vote in the primary against conservatives Alison McHose and Gary Chiusano. In the General Election that year, Graham donated to their liberal Democrat opponents and switched back from Republican to Democrat in order to vote in the 2008 Democrat presidential primary between Barack Obama and Hillary Clinton. Afraid of losing his seat on Stanhope council, a desperate Graham switched again to Republican, his current party today. In a matter of a few years time, George Graham flipped from Democrat to Republican, back to Democrat, and then to Republican again. Graham has been a Democrat for most of his adult life and affiliated with liberals for much of that time. Graham's political consulting business, York Strategies, which included partner James Barracato, came up with slogans like "Joe Doria is full time Bayonne" and "I'm with Joe," according to the Hudson Reporter newspaper. Although no longer a member of the Legislature, Joe Doria is still on the campaign trail with Jim Florio, only now they campaign for gun control and against the NRA (National Rifle Association). At a recent gathering the two called for new constraints on the Second Amendment, with Joe Doria calling the NRA "dirty". Not to be outdone, Florio added that the manufacturers and sellers of guns were, in his words, "Merchants of Death." As a Republican, George Graham closely aligned himself with former Freeholder Glen Vetrano. 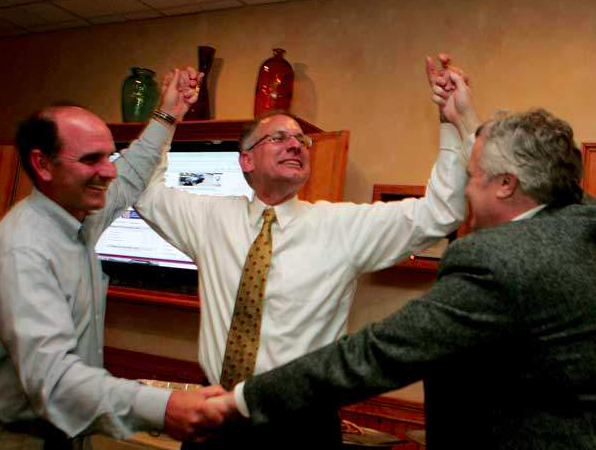 In 2012, Vetrano and Graham engineered the victory of Dennis Mudrick, who was elected to the Freeholder Board. But it didn't take long for Graham to deep six his former friends. After securing election to the Freeholder Board himself in 2013, the following year Graham instigated the ethics investigation that brought down Vetrano, and in 2015 he ran Jonathan Rose and Carl Lazzaro against incumbent Freeholder Mudrick, who was defeated in the primary. In 2016, Graham became the boss of the Freeholder Board -- controlling a majority made up of him, Rose, and Lazzaro. After winning the primary that year, he successfully talked Assemblywoman Gail Phoebus into challenging Senator Steve Oroho for his seat in 2017. This move essentially ended Phoebus' political career as well. Not content with ruining Assemblywoman Phoebus, Graham moved on to Republican candidate for Freeholder Herb Yardley, who Graham deliberately sought to hobble so that Democrat Dan Perez might win and the join Graham, Rose, and Lazzaro on the Freeholder Board. Worse still was the fact that Graham involved Freeholders Jonathan Rose and Carl Lazzaro in supporting the Democrat.